These flapjacks are really quick to make and taste AMAZING. They are delicious warm but I think they taste even better the next day, especially after a day of school! Heat the butter in a saucepan being very careful of the heat and when it is melted stir in the sugar. Carefully take the mixture off the heat and then spread out and press down hard into the pan. Get an adult to help you with the oven and cook for around 15 minutes until the flapjack is lightly browned. Leave to cool for 5 minutes in the pan before taking out and letting it cool on a cooling rack for a while. You can then cut it into squares- it should make 12- 15 but I bet you won’t be able to resist just having one piece! Baking for Kids- Best Ever Rice Krispie Cake! We have been trying out different recipes for Rice Krispie cake and we think this is the best one yet! I had lots of fun breaking up the chocolate and stirring all the ingredients together. I didn’t really like waiting for it to set for too long though! Grease a baking and line a baking tray. These cheesy scones are so easy to make and only really need adult help with the oven and supervision with the cheese grater so are great for kids to make. Mine haven’t risen brilliantly but I think that is because I used plain flour with baking powder so instead I have swapped this recipe for self raising flour- they still tasted amazing though! Sprinkle flour on your worktop and rolling pin and roll out the ball until it is about 2cm thick. Stamp out circles using cutters. Bake for 12 -14 minutes and then leave to cool for a few minutes. These scones are delicious eaten warm with butter. Like lots of children I quite like cooking from time to time and love to make cakes and puddings. I used to love this when I was a toddler and now I make it for my whole family- it’s really easy and my little sister can get involved. Heat the butter in a large frying pan. We have been experimenting with lots of cereal bar recipes recently and after trying lots of different adjustments have found one we all really like. These yummy bars are very filling and are perfect for a quick breakfast or mid morning snack and ideal for an after football treat. Try them yourself and see what you think! * Grease and line an 18 x 18 baking tray. * Add the oats stirring all the time. * The bars can then be wrapped individually for use through the week if you can resist eating them straight away! 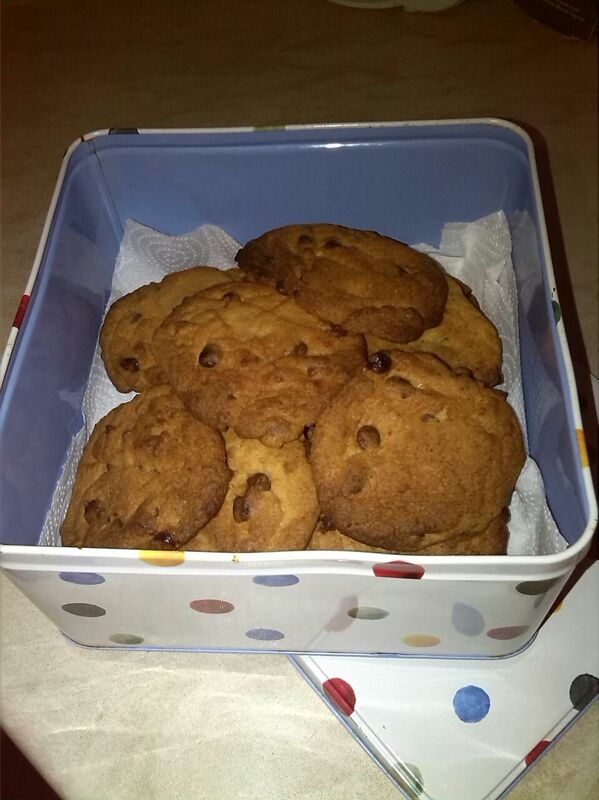 As promised I thought I would share the recipe for the cookies we like to make- they are really quick and easy and taste delicious! Cook for 10-12 minutes unless you prefer them a bit softer then about 8 minutes will do. Leave to cool slightly and then tuck in.